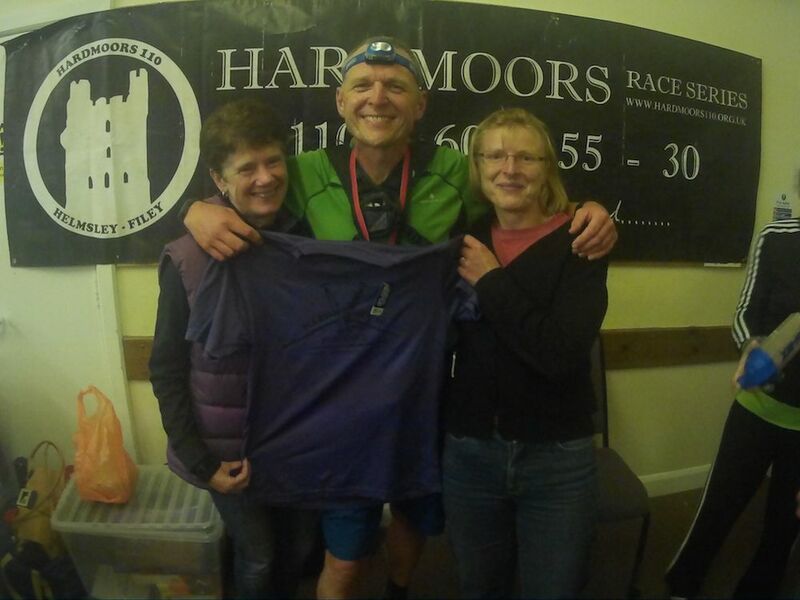 This race was the final race in the Hardmoors Grand Slam series and I was looking forward to it as much as the other three. I’ve really enjoyed preparing for each race and the challenge of arriving at the start of each one fit and ready to go has been big part of the enjoyment for me. I’ve had a good 8 week build up to the race which included the Tour of Skiddaw with Katrina four weeks ago. The other key sessions have been my weekly trips up and down Ben Lomond which I hoped had prepared my quads for the endless steps up and down which are a big feature of the coastal Cleveland Way path. Katrina and left Paisley after work on Friday and drove the familiar route to North Yorks. Martin and Lydia Dietrich had very kindly offered us hospitality for the weekend. 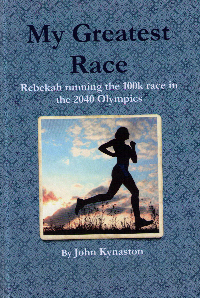 They live very close to Guidborough where the race starts so it was ideal. Lydia had prepared a lovely pasta meal for us with some special Swiss mountain cheese. When runners get together there is no gap in the conversation but we headed to bed about 10.30pm as we needed to be up by 6am for breakfast. Lydia took us to the start, then she was going for a run along the first part of the course before heading back to pick up Katrina (who had opted for a shorter run as she has the Loch Ness Marathon next weekend). 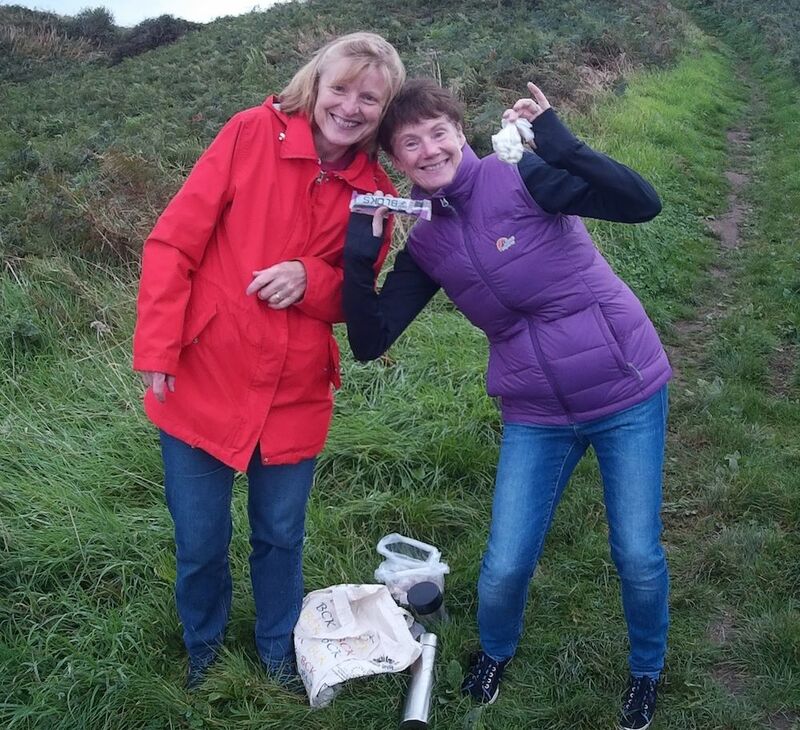 They would then cheer us on from Ravenscar onwards. 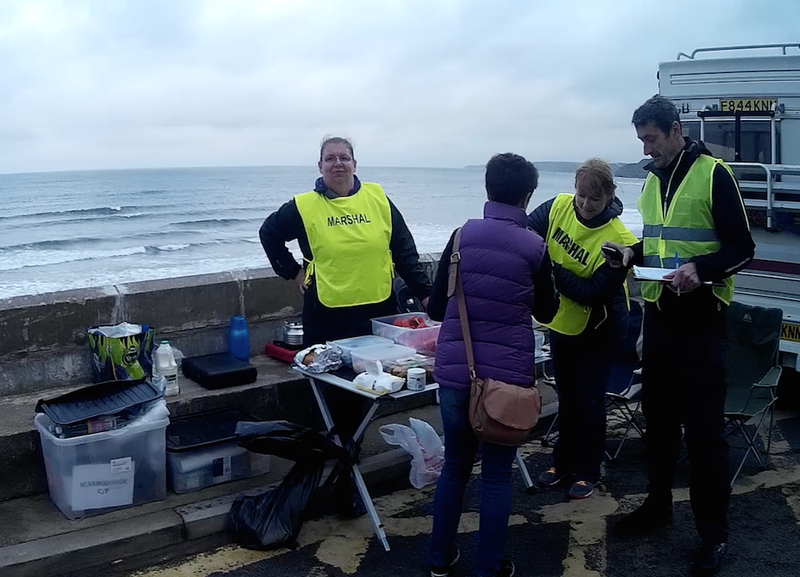 We arrived at the start HQ before the bus bringing the majority of the runners from Filey so we were able to leisurely check in our gear and get our race number. It was good to chat to several folk including Jamie Hauxwell who is leading the Grand Slam series. Before the race I was sitting in 2nd place and was hoping to be able to finish there! After Jon’s briefing we headed out to the start. The race got under way at 8.13am. 107 runners made it to the start. There was a comical moment as Jon had a starters pistol which, after the buildup of 5,4,3,2,1 didn’t go off!! He tried again and this time we were off and running. 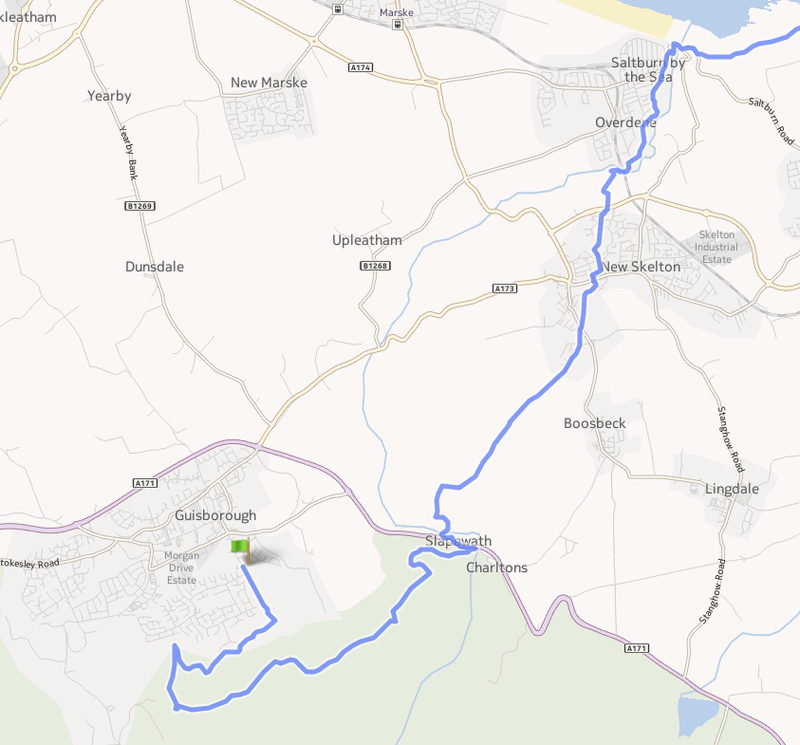 The first two miles of the route was through Guisborough Woods and up to Highnap where we would join the Cleveland Way. 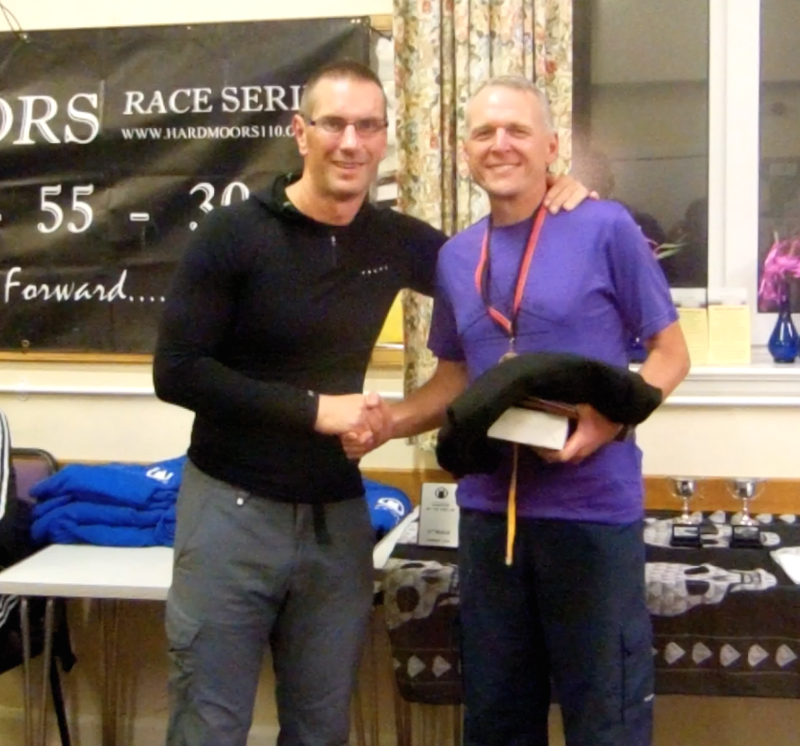 After the success I had had with running to heart rate for the Hardmoors 110 I decided to do it again with this race. My friend Robert Osfield had worked out from my previous races what my optimum heart rate should be for a race of this length and duration. He reckoned I should be able to maintain a HR of 135 for 12hrs so that was the plan. From the couple of races I’ve done I will say that it takes real discipline to stay at that level especially early on but for me it really pays dividends later. According to my Suunto the climb was 827ft and my HR was 131 so I didn’t push too hard. 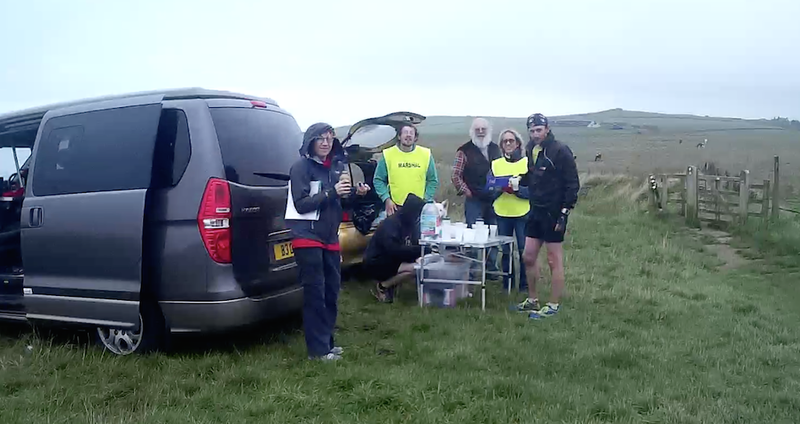 For the first 10miles to Saltburn I ran and chatted with various folk which helped pass the first couple of hours. 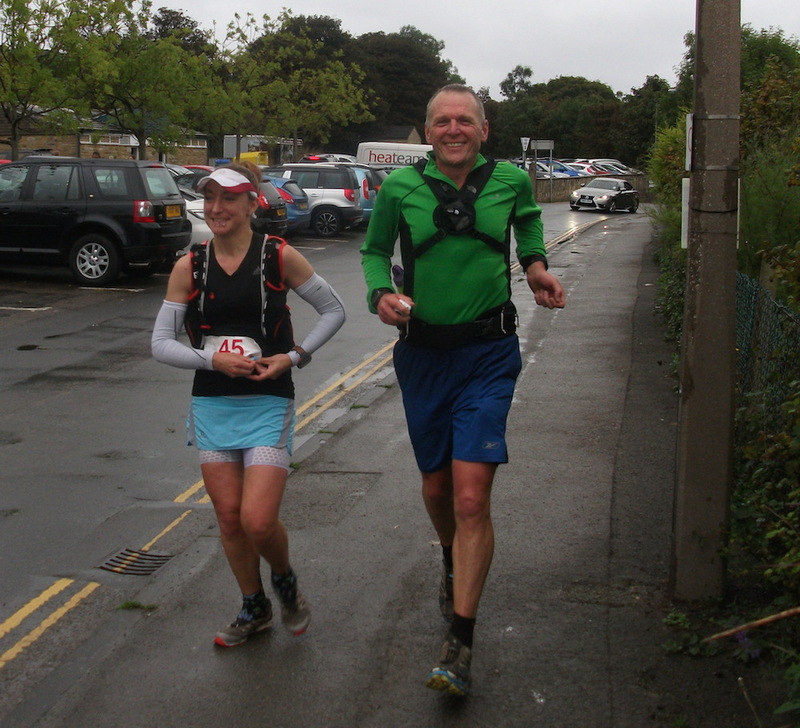 I ran most of the way with Nikki Carr who had completed the Hardmoors 160 in May. She was still wearing the finishers t-shirt and I did ask her has she taken it off yet?? Nikki has four young children and is about to start Uni to train as a Primary School teacher. 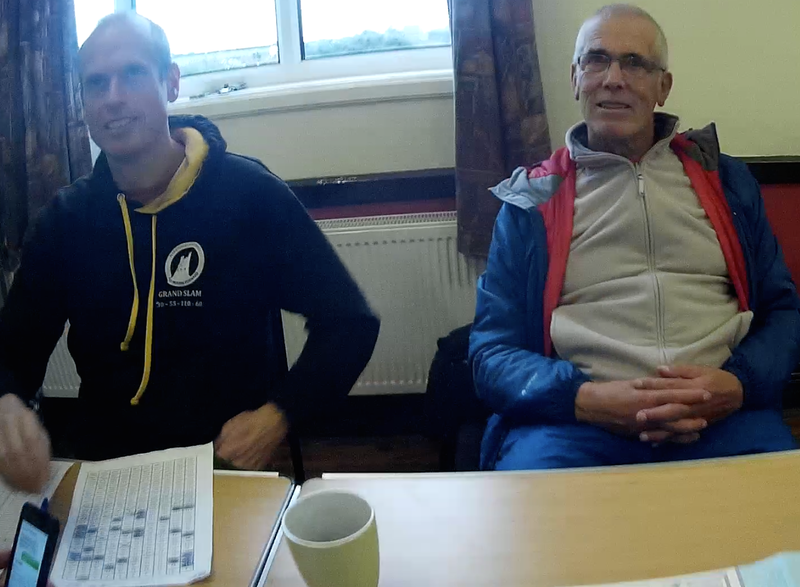 Chris Knight was also with Nikki and I. Chris has run the Lakeland 50 this year but it was his first Hardmoors race. I see from the results he finished in 15:00:03 so hoped he enjoyed it. I also ran with Lorraine Laycock for mile or so. Lorraine also entered the Grand Slam and in each race so far she has been 15-30mins behind me. Sadly I heard later she pulled out at Runswick Bay with feet issues. I ran with Dave Kamis and found out that he is hoping to do the West Highland Way Race next year so it will be great to see how he gets on. I hope he takes us up on our offer of somewhere to stay when he visits Scotland. 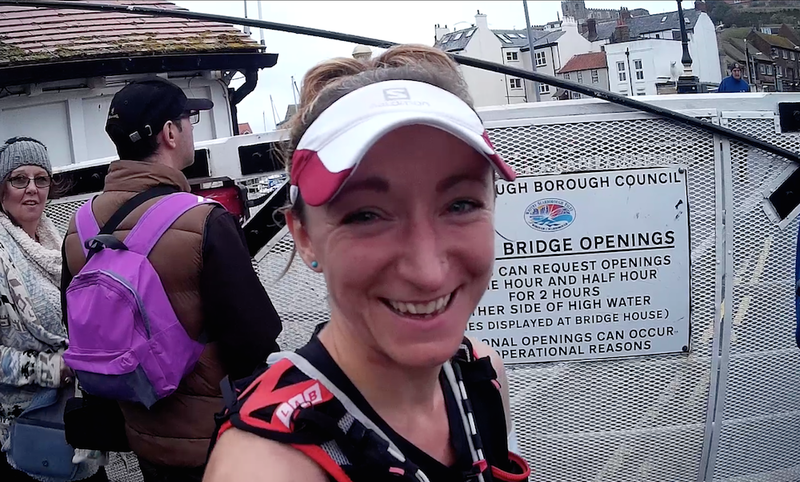 For my mini-splits I was working on 9miles to the first checkpoint at Saltburn. I was aiming for 1:29. As I arrived at the checkpoint my watch read 10.05miles and I had taken 1:49:55. So I was 20mins down on my plan but I knew that the final run into Filey was 1 mile or so shorter than the HM110 so it would even out in the end! Or so I hoped. I was in and out in 40secs thanks to the efficient checkpoint volunteers and supporters who filled my water bottle. I took half a banana to eat up the first hill. I left Nikki and Chris behind and caught sight of a group of 5-6 runners ahead. This became a pattern for the next few hours as I slowly caught up and passed groups of runners. One of the advantages of starting comfortably is that you are slowly catching people and even though I’m not really racing others it is an indication that things are going well. For the next section to Runswick Bay I had three mini-splits to Skinningrove, Staithes and the checkpoint. I also knew that it is very runnable so was happy to let my HR go up a bit as long as I didn’t red line. Looking at my splits now I ran the section in 2:03:51 against my plan of 2:09:00 with an average HR of 142 so I did push a little harder than planned. I was mostly on my own for these two hours but had a little chat with everyone I caught as I went past. I was feeling really comfortable and really into the race. The visibility was very poor though which was a shame as the views are amazing along the coast. When I did this section in the HM 110 it was through the night and I couldn’t see a thing. Now it was 10am and I still couldn’t see anything! The only issue I had was my stomach left a bit sore. I wondered whether the bug I’d had a few days ago was still lingering but I hoped not! I did three things to help …. I had my only wee of the whole race. I also had a good fart which got rid of some excess wind!! But the best thing was I loosened my waist band a bit and that really helped. Between Skinningrove and Staithes I made my only navigational mistake. I was heading up a hill when I saw a path to the left dropping down with a yellow arrow. I’m not sure why I thought I had to drop down but I did. I very quickly I realized this didn’t feel right but I’d done a hundred yards or more. I switched on the tracker on my watch and saw that my position was off the line so headed back up. I probably wasted 2-3 mins so nothing too bad but it just goes to show how easy it is to make a mistake. I was doing video clips every hour or so and got the camera out my pocket just before 3hrs and thought I’d do one when I come to the next uphill. I was heading into Staithes and basically it was all downhill for the next 20mins so didn’t get to do it until after Staithes. I caught number 91 as I came into Staithes and we climbed out together. I see from the result he was Mark Milner. Mark was also wearing Hokas so we had a chat about the benefits for ultras. I also see from the results Mark finished in 14:08 so I was over 2hrs faster from this point on. I was reliving a lot of HM 110 race as I ran and the next 3 miles into Runswick Bay was when I was running as hard as I could to beat the tide. Today I had no such worries as the high tide wasn’t until 4pm and it was only 12noon. I can’t remember if I caught anyone in the run in but I did spent time wondering where various people might be. I assumed that Martin was ahead but I wasn’t sure. I thought Kim would be ahead but maybe she went off even more cautious than I had as it was her longest ultra to date. If I caught them I would find out but if I didn’t I’d find out at the end! I came into Runswick Bay and the checkpoint in good spirits. The volunteers on the checkpoint commended me for my clearly labeled drop bag which encouraged even me even more! I took what I wanted from my bag, refilled my energy drink and was off again after a 2min 1sec stop for the next leg. I looked at my mini-splits and I was now just 16mins behind my sub 12hr plan. I was really happy with that as I knew I had an extra mile at the end which I didn’t have to do but was on the plan!! It was so good to be able to run onto the beach without having to wade through knee deep water like I’d done in the HM 110. The sand was firm as well and I ran right to the end where the path turns right and heads up the gully. As I headed up two lady walkers warned me that it was a very treacherous path!! I managed okay thanks! Jon had moved the checkpoint from Sandsend to Saltwick Bay which is a really good move as its only 5miles to Sandsend and it breaks up the gap to Ravenscar better. There is almost the same amount of ascent to descent on the section to Sandsend so I was able to maintain just under 11min mileing with my HR around 140. I was still moving well and still catching the odd person. I could see someone in blue ahead but couldn’t make out whether it was male or female. As I got closer I realised it was Karen Nash. She was starting to struggle a bit which isn’t surprising when I discovered she’d not only done the UTMB a few weeks ago but also a race last weekend! I gather she had a real battle all day but being the star she is finished in 13:27:21. I wished all the best and ran down to the car park at Sandsend 3mins faster than my sub 12 plan. 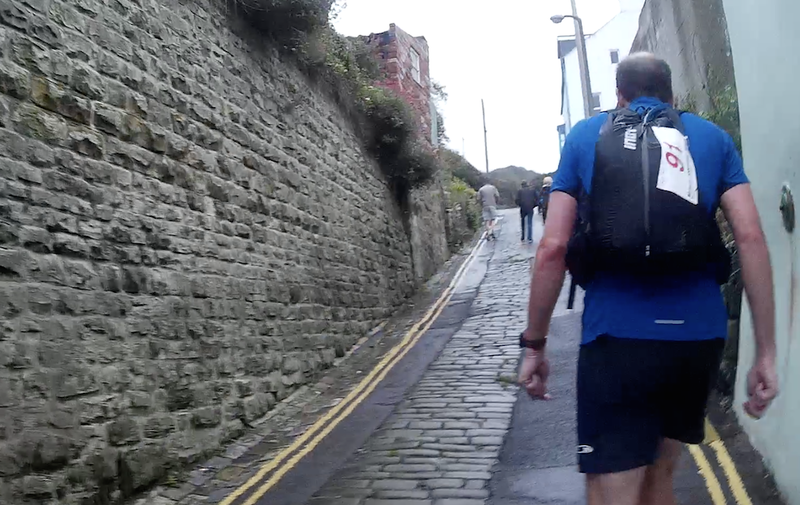 I could see another runner ahead on the road and wondered whether I might catch him by the time we reached Whitby. I walked and ran up the hill the golf course and then headed down. A couple of times I counted how many breathes it took me to reach a point the runner ahead had passed and I was slowly getting closer. As I did so I thought it might be Martin who was wearing a white top, white hat and blue shorts. Sure enough as we ran into Whitby it was Martin. I was moving a bit quicker than him and so didn’t really stop. We exchanged a quick greeting wished each other a good race for the rest of the way. There was another runner I went past at the same time but he was running on a slightly lower path along the top. Whitby was very busy with people enjoying their Saturday afternoon. It is really strange when you’ve been running for over 5hrs and 30miles and on your own to be amongst crowds of people strolling along with ice creams and caddy floss! As I approached the bridge to head up to the Abbey I saw Kim and Jayson waiting. The bridge was just coming down so I only had to wait 30secs and we were off and over. Kim said her IT band was hurting but she looked in good spirits. Jayson, her partner, was supporting her and I would see a lot of both of them over the next 7hrs! Jayson ran ahead of us through the narrow busy street shouting ‘Runners coming’!! I climbed strongly up the steps and once onto the coastal path starting running again. I glanced back at one point and could see the blue and white top of Kim not too far behind on her own so I assumed Jayson had gone off to drive to Saltwick Bay which was only a mile or so from Whitby. I was very relieved to see that the path was firm. I had read on Facebook that someone had said it was quite muddy and slippery but thankfully it was easy to run on. This is the last 12miles of the HM 30 route which started the Grand Slam on 1st January. On that day this section was very wet and very windy and very slippery underfoot! As I came to the checkpoint at Saltwick Bay I looked at my overall time and it read 5:38:52 against my plan of 5:37:00 so I had made up 15mins and I still had the bonus mile for the end!! I was in and out in 40secs having refilled my energy drink and took some heart shaped sweets which I thought was appropriate for the day! As I set off Kim arrived so I wondered when she would catch up. 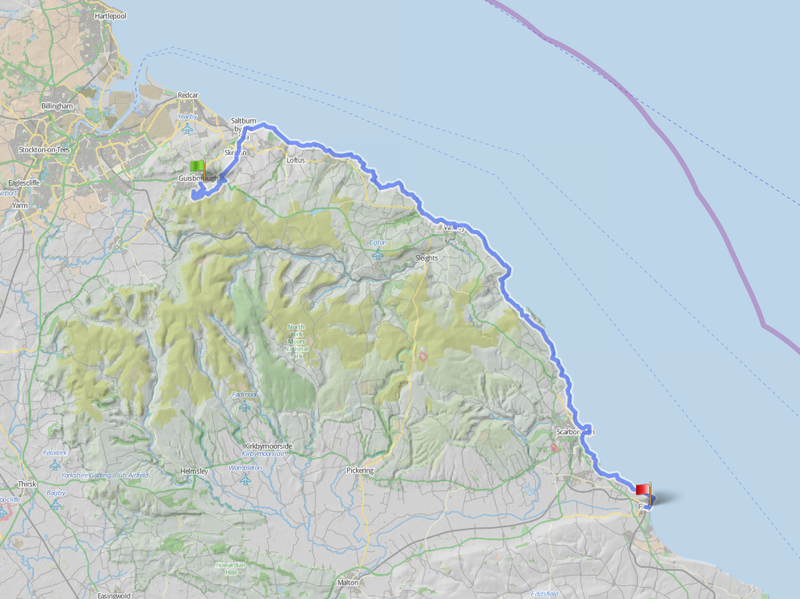 I didn’t have particular mini-splits for this next section to Ravenscar but I thought Robin Hoods Bay was about 5.5miles away so decided to find a landmark for 2.5miles or so and then I would use the extra checkpoint at Robin Hoods Bay as my next one before Ravenscar. I quickly settled back into my rhythm of running all the downs and flat and using the ups to drink, take a photo or video and check mu progress. My heart rate was around 137 which I was really pleased with. It was encouraging that I was able to keep it that high as often at this stage of a race I would be starting to tire and consequently the HR drops. At 2.50 miles I came to a bridge so I used that for my mini-split. Just afterwards Kim caught me up running well so we ran into Robin Hoods Bay together. In the HM 110 the last few miles into Robin Hoods Bay seemed to take forever but as we were chatting away the miles flew past and we soon arrived. By now it was Kim’s longest ever race and she was moving really well. Of all the people I had caught since Saltburn Kim was the only one who stuck with me and increased her pace. I’m not sure if Jayson encouraged her to stick near me but it was certainly helping us both. Kim told me all about the OCC race she did in Chamonix and supporting Jayson on the UTMB. It sounded amazing and I’ve decided I must do the UTMB one day! As we approached Robin Hoods Bay Kim said that she was meeting Jayson and planned to have a slightly longer stop to change her top and have a cup of tea. I wanted to push on but fully expected to see her again. Jon Vernon was on the checkpoint. I had a couple of cups of coke and was straight off down the steep hill and back up on to the costal path. I as back on my own but I could see a runner in the distance and again wondered whether I’d be able to catch him by Ravenscar. I reckoned it was just over 4 miles away but the last mile is a steep climb up so knew the pace would be slower. My sub 12hr plan had me at Ravenscar in 7:44. I had an hour to cover the 4 miles so I thought that was achievable. I love to break down these long races into manageable chunks and this was a perfect example. I had been running for almost 7hrs but still had 5hrs to go and it can feel a bit overwhelming but if I concentrate on the next 30mins or the next hour it doesn’t feel so difficult. Just as I was descending the steps down past Boggle Hole Youth Hostel I saw a runner coming out of the grounds. He asked me which was to go as he read on the route description to go right on the road but he turned 50 yards too early. We climbed up the hill together and ran the rest of the way to Ravenscar. Stuart hadn’t done the route before so I tried to fill him with what was left to do. As we chatted he asked me how old I was. When I said 55 he said I’ve got 2 years on you so I knew that he too was in the M50 class. I hadn’t thought too much about that as I didn’t really know if anyone else over 50 was ahead of me. But now I knew I’d need to finish ahead of Stuart to have a chance!! There was still over 20miles to go so no need to race yet!! So we worked together up the hill and into the checkpoint at Ravenscar. Again chatting with someone made it easier. Not far from the checkpoint was a girl taking some photos and she told us we were 14th and 15th which surprised both of us as we had no idea where we were in the field. Andy and Sarah were manning the checkpoint so it was great to see them. I wasn’t sure if Katrina and Lydia would be there so it was a real bonus that they were. They efficiently sorted me out. Lydia poured some of her delicious homemade soup while Katrina filled my energy drink. I sat down for the first and only time to drink the soup and eat my favourite Greek style yoghurt. I was up after a couple of minutes and ready to set off for the final 20 miles. A quick kiss from Katrina and thanks to Lydia I was out the door. As I left the checkpoint Andy pointed to his Hardmoors Grand Slam hoody and said one of these will be yours soon! I looked at my mini-split cards and noted that my aim for leaving Ravenscar was 7:46 and with the 3:34 min stop I was leaving at 7:48:16. My sub 12hr goal was very much on but I knew that I had very little time to play with. I would have to run as much as possible and walk hard on the uphills. It is downhill for over a mile to the gate over the field and back onto the coastal path so I decided to run all the way. I was feeling good especially as when I left Stuart was still in the checkpoint changing his top. I hoped to get a bit of a start on him. Kim had arrived at Ravenscar while I was there so I knew she wasn’t too far behind either. This was going to be fun trying to stay ahead of them!! When I got onto the path I remembered a conversation I’d had with Dave Troman on our recce run in April. We were talking about the HM 110 but we agreed that if we were still running at this stage (90miles or so) then we could make up lots of time as it’s a gradual downhill run for a few miles to Hayburn. So I was keen to make the most of it and run as much as I could. Once again I was glad of all those trips up and down Ben Lomond as my quads felt fine and I was moving smoothly. My feet were also in good condition. I could feel one hot spot on the little toe of my right foot. That often takes a beating so I had put a plaster on it before the race and it certainly seemed to help. I reached my first mini-split (3.36miles) in 35:31 against my plan of 35:00 so I was pleased with that but I maybe had pushed a little too hard. For the next 30mins or so I went through my only real tough section. I found it harder to get running after a walking break, felt more tired and started to doubt I could achieve my sub 12hr goal. I battled for a while and it didn’t help when Stuart goes running past me very strongly. I wished all the best and went back to my internal struggle. A few years ago I went to a seminar with work that Jack Black had led for school students about positive thinking and goal setting. In particular I was struck by the way Roger explained how the mind affects the way you feel physically. I was definitely being affected by my mind for the first time in the race. So I decided to think positively and get myself through this patch. So I repeated ‘You are strong’ ‘You are fit’ over and over again. And I mean over and over again until I really believed it and was moving better again. It didn’t take too long before I felt loads better again and was back chasing that sub 12hr goal. As I came round a corner I saw two figures in the distance and realised it was Katrina and Lydia. It was so good to see them and they came just at the point where I had got going again and felt positive. I asked how Martin was doing and Lydia said he’s about 10mins behind so I knew I couldn’t relax! By this stage of a race I can only do what I can do and while I knew no-one else would be running up those steps if I was caught by others it was because they were going better than I was and there wasn’t much I could do about it! I could see a couple of runners ahead and again wondered whether I might catch them. I slowly drew them in and realised that one of them didn’t have a rucksack so I assumed was a support runner. As I went past he asked whether I was the blogger running by heart rate? 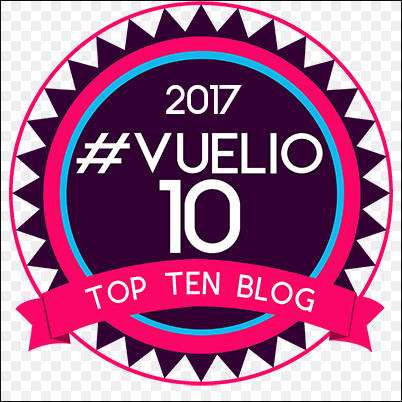 The fame that a blog brings!!! I like the approach to Scarborough in that you can see the castle from about 6 miles away, and then you lose it for a mile or so as you head inland and then it appears and disappears again until it finally it is there to stay. I descended the steps and onto the promenade. Jayson was there again in his van waiting for Kim so I assumed she wasn’t far behind. I knew it was 3miles to the checkpoint at the far end of the prom. I had 30mins to make it for my planned 10:01 goal. Could I run at 10min per mile after almost 50 miles? I was feeling okay so decided to run for 100 breathes then walk for 10 and repeat. I did that for a few cycles then got fed up of counting so went back to my ‘You are strong’ ‘You are fit’ mantra. I also added in ‘You are awesome’ for a bit of variety!! There are loads of bins and benches along the way so I set myself goals of running to a distance point before taking a short walk. I had my watch on split time/pace and I could see that my average pace was under 10mins per mile. Once I got round past the castle I was really on a roll and didn’t bother with the walking breaks. I believed the ‘You are strong’ bit and just kept running. Suddenly I saw a runner ahead walking and it was Stuart. I think he was pretty surprised to see me!! He encouraged me to keep going. I ran into the checkpoint to see Katrina and Lydia! It was great to see them again. Katrina filled up my bottle with coke for the final leg. I also took a piece of watermelon which went down a treat. They told me I was looking great and they would see me at the finish! I was in and out in 49secs!! A man on a mission. Again I left right on the money for my sub 12hr plan 10:01:12 to 10:02:00!!! I was now all of 48secs up. My plan had it as 9.79miles to the finish but it could be about a mile less than that as the location had changed from the HM 110. Anyway I had just under 2hrs to cover the final leg. In the HM 110 it had taken me 2:35 so I knew it was possible but again I didn’t have much room for error. I know that it is only a number and if I finished in 12:05 it would still be a great run but somehow these numbers are important to me!! It definitely helps with the motivation so that sub 12hr goal was the driving force for the next 2 hours. I even decided I would rather finish 2nd M50 and be under 12hrs that 1st M50 in 12:05!! I climbed up the hill out of Scarborough as best I could. My legs were feeling a bit wobbly and it took me a few minutes to really get running again but a few more ‘You are strong’ ‘You are fit’ got me going again. I had a lovely run around the field before you head up to the road. Once on the road I ran pretty well all the way down to Cayton Bay Holiday Village. I was running out of coke and still had 5-6 miles to go. I saw Jayson coming towards me looking for Kim. I asked him whether he had some water. He said he had some coke for Kim. He very kindly gave me some saying Kim won’t need it all. I hope that was true!! I now had 4 miles to Filey Brigg and then whatever it was from there to the finish. I assumed just over a mile. The end was in sight but I still had an hour or so to run so couldn’t relax. I was going as well as I could but having to really work hard. My average HR for this 4 mile section was 117 so I must have dropped the intensity a bit. 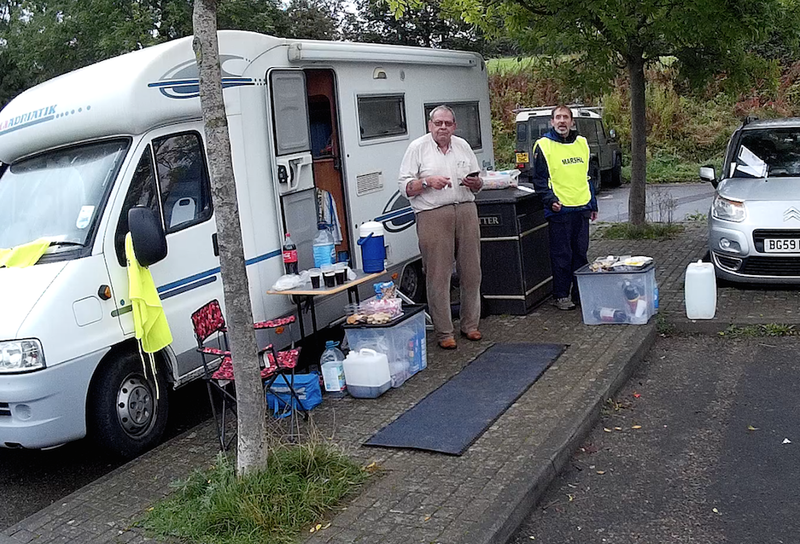 I was running out of coke again so when I saw two guys outside their caravans I asked could they top up my water bottle. As the guy went inside to refill it Stuart and another runner went past!! This time it was my turn to encourage him and acknowledge how well he was running. I suspected I wouldn’t see him again until the end! I thanked the guy for the water and explained it would get me to the finish!! It was now getting darker but I hoped to get to the end without having to get my head torch on but I thought it was unlikely. I could see Stuart ahead. He wasn’t disappearing but I wasn’t gaining either. I broke up the 4 miles into 1 mile legs and ticked them off. Suddenly another runner came into view who was walking. It was Neil Ridsdale. I hadn’t realised he was running. If I had I wouldn’t have been bothered about the M50 prize as he is normally well ahead of me! When I caught him he said that he’s been doing a lot of cycling recently and his legs aren’t working!! He also said the guy just ahead is a M50 as if I didn’t know!! 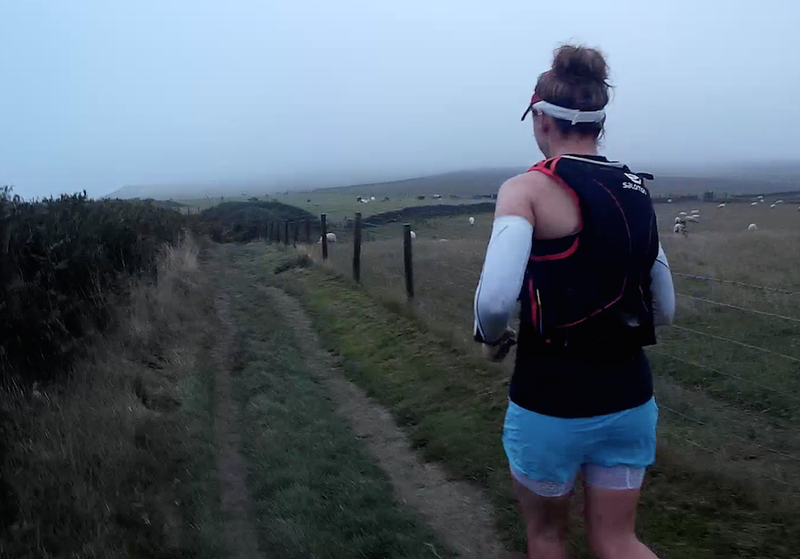 With just over a mile to go to Filey Brigg I was caught by Kim and at the same time Jayson had run out from the finish. The three of us ran together. It really helped me as I hung on to their backs. Jayson said that it had taken him 20mins to run up from the finish and it was now 11:30 race time. I said but you are Jayson and he said you are Kim and John and you can do it! Maybe he has been to Jack Black’s seminars as well!! It was getting really dark now and Jayson lit the way with his head torch. I realised I needed to get mine out. I was hoping I wouldn’t need it so had packed it at the bottom of my pack. So it took a minute or two to get it out. Jayson came back to check I was okay! What a star. He ran on to catch Kim and I pushed on. I went past the Filey Brigg sign post which says Helmsley 109 miles. I couldn’t read it as it was pitch dark but I remembered it well from our recce in April and the 110 in May. I caught up with Jayson and Kim on the steps down to the beach and the three of us ran towards the prom together. Jayson said there is a final steep hill up the town and the finish. As we came off the beach there was a small rise. They carried on running while I walked to take a final drink. To be honest I was keen to finish on my own and thought it would be good for Kim also. I walked up the hill not far behind them then watched as they ran on to the finish. I switched off my head torch and followed them running along the road past folk out for an evening stroll. 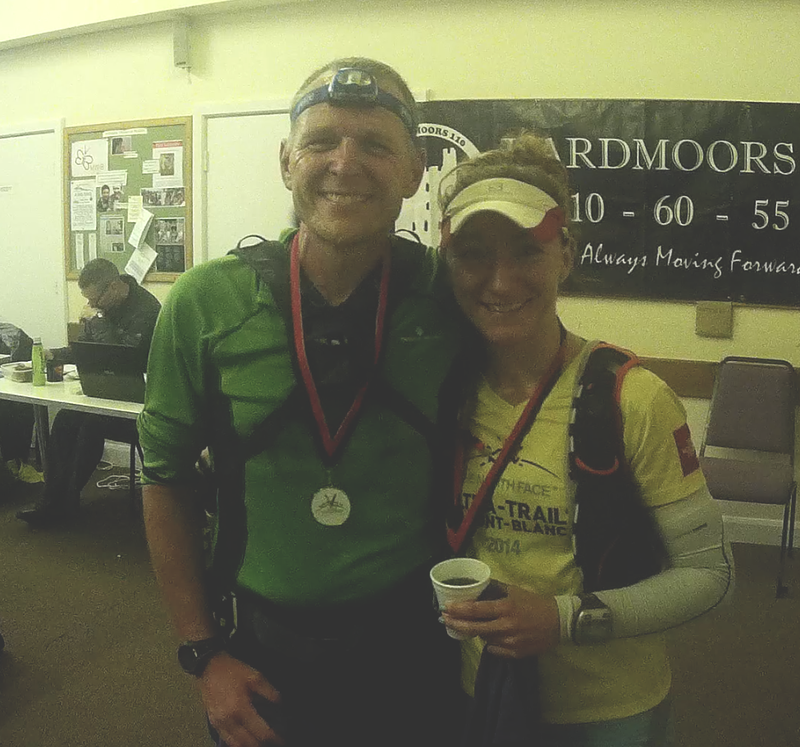 I could hear Katrina cheering before I saw her and there I was at the finish of the Hardmoors 60. I entered the hall to be greeted by Jon & Shirley and lots of runners and supporters cheering. I received my medal and t-shirt, congratulated Kim and Stuart, thanked Katrina and Lydia for their support and headed up the stairs (very slowly) for a much needed shower. Once I was clean and warm I sat, eat and drank and cheered on as runners continued to finish. Martin finished in 12:31:30. At the prize giving I received my hoody for completing the Grand Slam and a plaque for finishing 2nd overall. As Lydia drove us all back to their house we chatted about the day, the race and relived it all again. It’s when you drive back do you fully realise how far you have run!! Thanks so much Martin and Lydia for your superb hospitality. We look forward to hosting you in Scotland sometime soon. What a great day and what a great year I’ve enjoyed running the Hardmoors Grand Slam. Many thanks to Jon & Shirley and their band of superb volunteers who organise these races. I would fully recommend any of the Hardmoors races but the Grand Slam is well worth the effort! 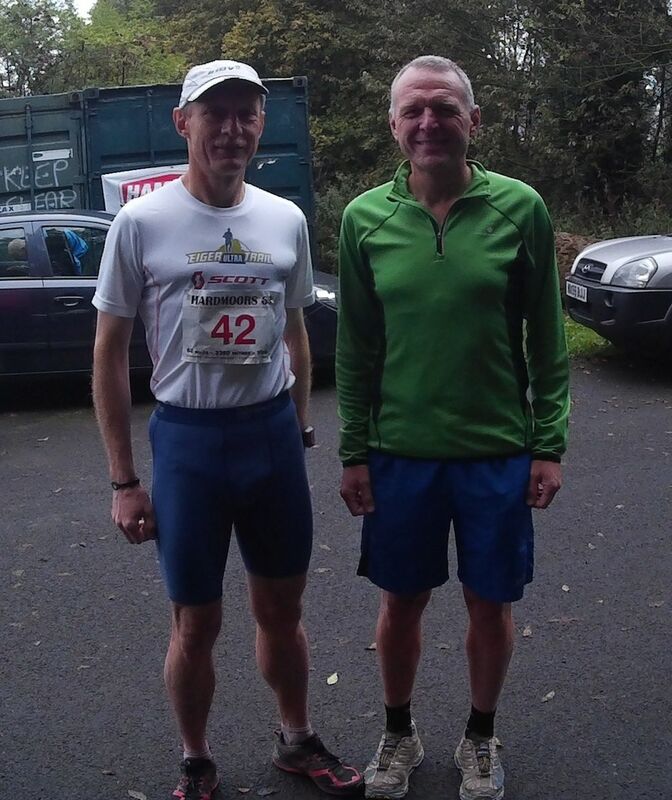 This entry was posted in Hardmoors 60, race reports. Bookmark the permalink. Brilliant run John and another inspiring blog ! 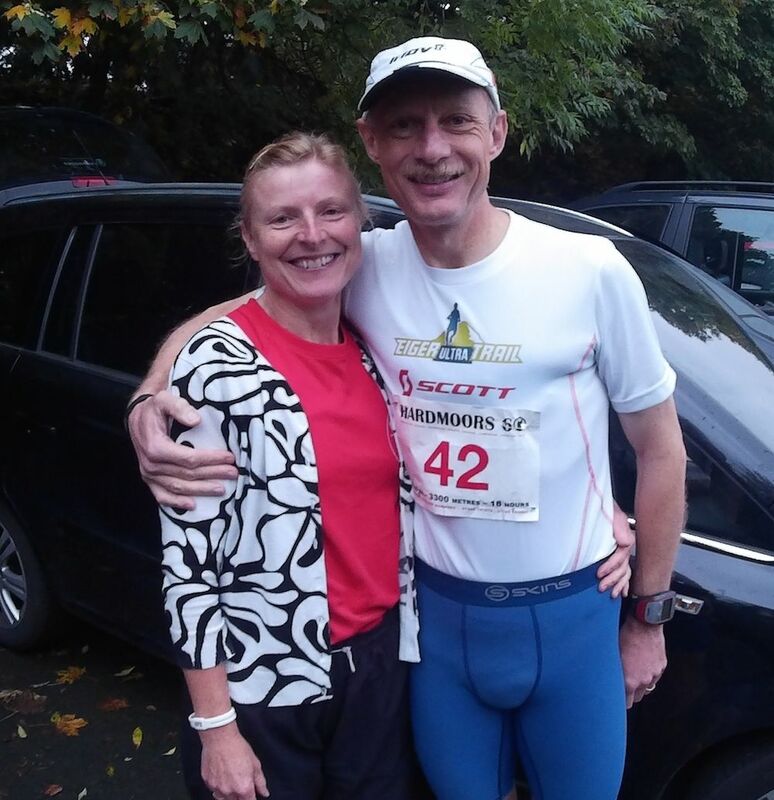 Well done John, great run and great blog. I never expected to get a mention let alone a picture of my best side as we were leaving Staithes!! I was really impressed with the Hokas, I’m definitely a convert. Great run and post John. 2nd in the Grand Slam too. To training for, avoiding injury, tapering and race well over four different races in one year is a big achievement. You’re average HR of 136 being a little higher than pre-race estimate just shows how hard you raced. I suspect that you pushed on a little too hard between Saltburn and Saltwick Bay and it may have contributed to the later struggles. When working a little harder you digest less food and drink, and burn a little more glycogen which will be imperceptible at the time but later you’ll feel the effects when you have less in the tank. On the mental side, it’s interesting how you mantra’s helped. Negative thought processes really aren’t helpful for ultra-runners, unless it gives them the kick to evaluate what is wrong and fix it. Getting the adrenalin back pumping in lows is pretty important, as it’ll not only give you a physical boost but can help diminish the perception of pain. Caffiene and music might be good ways on getting one back up. Having good support crew can provide this boost too. I have found that Splits can work both ways, if you are close to your split then you can feel that your goal is still achieveable and worth pushing on for, but once you start slipping behind it’s easy to get demoralised and you then have to distance yourself from them and find other means for keeping you motivated. Fantastic Grand Slam achievement. Huge respect for you, well done. Great read John. I also feel loads better about my navigational error now as it was the exact same one you made, the only difference being that you realised quicker and reacted in a much more calm and professional way whereas I panicked a bit. You learn from these things I suppose. Glad you had a good day, will no doubt see you at another race soon.